Today, we are comparing the newly launched Honor 8X with the Xiaomi Redmi Note 5 Pro to see how they fare on paper. The Huawei’s sub-brand Honor has finally introduced its Honor 8X in Indian markets after announcing the phone in China last month. The smartphone comes with a dual-camera setup, a display notch and more. The Honor 8X is starting from Rs 14,999 in India and all set to compete with the Xiaomi’s Redmi Note 5 Pro, which is also available for the exact same price. Now, we will compare these two smartphones specifications to see where they stand, at least on paper. Let’s begin with comparing the display of these two smartphones. The Honor 8X sports a 6.5-inch display, which offers a resolution of 2340 x 1080 pixels. On the other hand, the Xiaomi Redmi Note 5 Pro has a 5.99-inch display with a resolution of 2160 x 1080 pixels. The Honor 8X comes with a bigger display and offers a slightly resolution than the Xiaomi Redmi Note 5 Pro. So, if you’re the one who prefers to watch movies and videos on your phone then the Honor 8X might be the device you can look forward to. The Honor 8X is powered by Kirin 710 octa-core processor, while the Xiaomi Redmi Note 5 Pro is backed by a Qualcomm Snapdragon 636 octa-core processor. Coming to the cameras, the Honor 8X has 20MP + 2MP dual camera set up at the back. On the other hand, The Xiaomi Redmi Note 5 Pro comes with 12MP + 5MP dual rear cameras. On the front, the Honor 8X has a 16MP unit, while the Xiaomi Redmi Note 5 Pro has a 20MP sensor. If you are a selfie lover who doesn’t care much about rear cameras then the Xiaomi Redmi Note 5 pro looks better in this department than the Honor 8X. However, we still can’t justify the camera quality by taking a look at megapixels the phone has to offer. Both the device are available for Rs 14,999 in India. 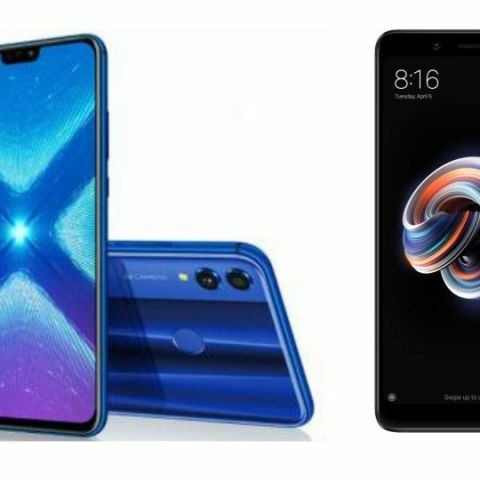 The Honor 8X will go on sale from October 24 on Amazon, while the Xiaomi Redmi Note 5 Pro is available on Flipkart at Rs 14,999.